Femtosecond laser nanoprinting and projection 3-D bioprinting techniques allow the direct writing of 3-D designer scaffolds used for tissue engineering and regenerative medicine. 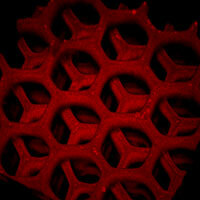 These 3-D biomaterials are functionalized with precise control of micro-architecture, mechanical (e.g. stiffness and Poisson’s ratio), chemical and biological properties. Design, fabrication, and experimental results will be discussed. Dr. Shaochen Chen is a professor in the NanoEngineering and Bioengineering departments at the University of California, San Diego. He also directs the Biomaterials and Tissue Engineering Center at UCSD. From 2001 to 2010 Chen was a professor and a Pearlie D. Henderson Centennial Endowed Faculty Fellow in Engineering in the Mechanical Engineering Department at the University of Texas at Austin. Between 2008 and 2010, he served as the program director for the Nanomanufacturing Program in the National Science Foundation. Chen’s primary research interests include biomaterials and bioprinting, nanomanufacturing, regenerative medicine, tissue engineering, lasers and nanophotonics. He has published 101 papers in top journals such as Nature Communications, Nature, Nature Materials, Nano Letters, Biomaterials and Advanced Materials, as well as 12 books and book chapters. He is a recipient of the CAREER award from the National Science Foundation and the Young Investigator award from the Office of Naval Research. Chen is a fellow of the AAAS, American Institute for Medical and Biological Engineering, American Society of Mechanical Engineers, International Society for NanoManufacturing and SPIE. Q: From my understanding you use UV laser. How do you control the exposure area, because all of the area of resist which is exposed by UV light will be crosslined without a mask? A: You turn off the laser beam when scanning those areas not to be crosslinked. This control is dictated by the images of the 3-D part. Q: About nervous tissue regeneration, like in the spinal chord, how important is cell adhesion to a biodegradable scaffold? A: The cells need to follow the geometrical guidance of the conduit (scaffold). Q: From a bioprinter standpoint, how would you rate in order of importance for tissue engineering resolution, build volume and speed? Would a multimaterial option be very useful? A: That depends on specific applications. In general, resolution, speed, volume and a multimaterial option are all important. Q: Do you control the polarization of the laser light to affect the optical properties of the printed material, such as its birefringence? A: For tissue scaffold fabrication, polarization is not important. Q: What type of stage motion is required for use with DMM arrays? For isntance, must air bearings be used, or can more simple stages be employed? A: That depends on the resolution requirements. I do use a floating table for a high-resolution printer. But in general, such table is not critical.